A Parish Guide, an introductory tool for the average person. Buy a modern version of the Bible such as: The New American Bible or The New Revised Standard Version that prints not only the biblical text itself (as in a "Reader’s Bible"), but also extensive "editorial material," including introductions, footnotes, cross-references, with maps, charts, time-lines, etc. You can buy expensive or relatively inexpensive versions. Be careful of a paraphrase in any version. What you get is the author's interpretation of what the text means, not a translation of the original languages in which the books were written. This new English translation of the Bible, Old and Revised New Testaments, was prepared especially for Catholics by the Catholic Biblical Association of America, using the Septuagint (Greek Version) for the Old Testament. Includes the books of Tobit, Judith, I & II Maccabees, Wisdom, and Sirach (Ecclesiasticus) not included in Protestant bibles. The Collegeville Bible Commentary (CBC) is based on the New American Bible. It is a simple and easy guide to reading and understanding the Bible. The Collegeville Bible Commentary series contains time-tested analysis, from a wide variety of authors, that provides a fresh approach for those looking for help in understanding and appreciating the Good News. The Collegeville Bible Commentary is available in an affordable two-volume paperback edition. Perfect for classroom use or personal study. Bible Atlas - a book containing maps and diagrams, and often pictures and helpful discussions of biblical geography. Good ones include the Harpers Bible Atlas and the Macmillan Atlas of the Bible. Maps - Maps are another way of understanding the Bible. Over the thousands of years of Biblical history, God's people have been on the move almost constantly. From a historical perspective, the saga begins with Abraham, who emerges from the city of Ur in southern Mesopotamia -- the land between the rivers, the Tigris and the Euphrates, what is called the "Cradle of Civilization." This is the same area we find in the story of Adam and Eve: A river rises in Eden to water the garden; beyond there it divides and becomes four branches. The names of the rivers are the Pishon, the Gihon and the Tigris and Euphrates (Gen 2:10-14). Bible Commentary - a book of modern scholars’ explanations of biblical texts, arranged in biblical order (book-by-book, chapter-by-chapter, verse-by-verse); it usually includes notes on items necessary for understanding the text (historical, geographical, linguistic, etc. ), and a scholar’s interpretation of its meaning. Bible Dictionary - contains articles on most biblical names, places, images, themes, and other words in alphabetical order; the best ones currently available are the Anchor Bible Dictionary (6 vols. 1992), the Interpreters Dictionary of the Bible (4 vols. 1962; and a "Supplement" vol. 1969), and the HarperCollins Bible Dictionary (1996). Lexicon - a dictionary explaining the meaning of ancient Hebrew or Greek words, and usually also providing some references for where and how they are used in ancient literature. 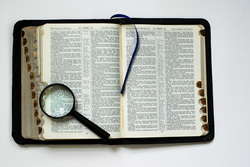 Concordance - a book listing all the passages in the Bible (OT and NT) in which a particular word is used; be careful when using English concordances, since a particular Hebrew or Greek word might be translated with various different English words; so always look up related words and synonyms! Parallel Bible - an edition which prints several English translations (sometimes also the original Greek or Hebrew text) in parallel columns on the same pages so you can compare them easily. What does the word "Bible" mean? The word "Bible comes from the Egyptian word for parchment, byblos. The Greek word biblios means books or scrolls. Later, it was translated into Latin, biblia, meaning "book." The Bible is more than a single book. It is a library--ta biblia, which means "the books." In this Bible library, as in any library, you will find a variety of books--prose, poetry, songs, prayers, history, folklore, sagas, wisdom, letters, parables, proverbs, prophecy, etc. What does the word "Testament" mean? The word "testament," as used here, does not mean "last will and testament," a legal document whereby a person disposes of earthly goods. The word "testament" is from the Latin word testamentum. which translates the Hebrew word for "covenant," berith. A covenant is a pact or agreement between two parties, God and the people of God. "Covenant" is one of the major themes in both the Old and New Testaments. It tells of the pact which God made through Moses with the people of Israel (the "old" covenant), and that which was fulfilled in Jesus (the "new" covenant). The word "old," in regard to Testament, does not mean that it is no longer useful. For Christians, it simply means the First Testament, or the Hebrew Scriptures. What does the word "canon" mean? The Canon is an official list of books that a particular religious group considers as its "core scriptures." The group uses these "authorized books" as the basis of its communal life, teachings, and actions. The Greek word originally meant "measuring rod; rule; criterion." That depends which bible you are using. There are 39 books for Jews and Protestants and 46 for Catholics. Jews recognize only the 39 books of the Old Testament written in Hebrew (a few passages are written in Aramaic, the language Jesus and his contemporaries spoke). While Jews count them as 24 books ( considering the "Twelve Minor Prophets" as one book), Christians subdivide some of these to make a total of 39 books. Catholics include seven other books, which belong to the Greek translation of the Bible called the Septuagint. How many books are there in the Septuagint? The Septuagint is a collection of 46 books of ancient Jewish Scriptures translated into Greek, including all 39 books of the Hebrew Bible, as well as the seven additional books not found in the Hebrew Bible. The Septuagint was translated and compiled around 250 BCE, probably in or near Alexandria, Egypt. It groups the books into four categories (Law, Historical Books, Wisdom Writings, and Prophets). The name "Septuagint" (meaning "seventy") is often abbreviated LXX. An ancient Jewish tradition claims that 70 scholars made the translation in 70 days. The LXX was considered scripture by most Greek-speaking Jews and by early Christians. The seven additional books of the Septuagint (many written in Greek) include Judith, Tobit, 1 and 2 Maccabees, Wisdom, Sirach (also called Ecclesiasticus) and Baruch, and also parts of the books of Esther and Daniel. Catholics call these seven books Deutero-Canonical, meaning "second canon." The word "canon" means "rule of faith," the authoritative list of books approved by the Catholic Church. Protestants call these books Apocryphal, meaning "hidden." During the Reformation, Protestants rejected these later writings and accepted only the 39 books of the Hebrew Old Testament. What does the word "pseudepigrapha" mean? Pseudepigrapha (literally "false writings") refers broadly to other ancient Jewish writings which are not part of the Hebrew Bible nor of the LXX, but are often attributed to a biblical figure (e.g. Jubilees, 1 Enoch, the Testaments of the Twelve Patriarchs, etc.). They were popular among ancient Jews, and thus are very valuable for historical purposes, even if they were never considered biblical. The New Testament was written entirely in Greek, the common, or koine, language spoken at the time. 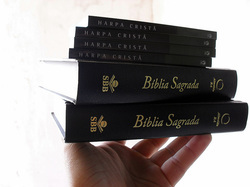 It consists of 27 books, which are identical for all Christians. There are four gospels (Matthew, Mark, Luke and John), one book of early church history (Acts of the Apostles), 21 letters, also called "Epistles" (written by Paul and other authors), and one prophetic book (the Book of Revelation). The books of the Jewish Old Testament are divided into three categories (Torah, Prophets, Writings), while Christians rearrange them into four categories (Law, Historical Books, Wisdom Books, Prophetic Books). Law - usually called the "Torah" (Hebrew for "Teaching" or "Instruction"), or the "Pentateuch" (Greek for "five scrolls"), or "The Five Books of Moses" (since it was traditionally thought that Moses himself wrote all of them). These first five books of the HB (Genesis, Exodus, Leviticus, Numbers, Deuteronomy) are considered the "core" of the Bible by Jews. Prophets - called the "Nevi'im" in Hebrew; subdivided in Jewish Bibles into the "Former Prophets" (Joshua, Judges, 1 & 2 Samuel, 1 & 2 Kings - considered "Historical Books" by Christians; also contain stories of early "prophets" like Elijah, Elishah, Samuel, Nathan, etc. ), and the "Latter Prophets" (Isaiah, Jeremiah, Ezekiel, and the "Twelve Minor Prophets"; note that Christians also count Daniel as one of the major Prophets, but Jews put Daniel in the following group). Writings - called the "Ketuvim" in Hebrew; includes the books of Psalms, Proverbs, Job, Song of Solomon, Lamentations & Ecclesiastes (called "Wisdom Literature" by Christians today), and the books of Ruth, Esther, Ezra, Nehemiah, and 1 & 2 Chronicles (considered part of the "Historical Books" by Christians), as well as Daniel. Tanak - The Hebrew Bible is traditionally called the "Tanak" by Jews (from the first letter: Torah + Nevi'im + Ketuvim) or the "Old Testament" (OT) by Christians; also called the "First Testament" by some modern scholars. It is a large collection of different books considered "canonical scriptures" by all Jews and Christians. Most are written in Hebrew (a few parts are in Aramaic), mostly between the 9th and 6th centuries BCE. Criticisms - various methods of doing biblical exegesis, each having a specific goal and a specific set of questions; biblical "criticism" does not mean "criticizing" the text (i.e. what you don't like or don't agree with), but asking "critical" questions (based on "criteria" that are as clear, careful, and objective as possible). Genre - the literary "form" or "category" of a text. Larger genres in the NT include Gospels, Letters, Acts, Apocalypses, Novels, Biographies, etc. Smaller genres within the Gospels include parables, sayings, controversy dialogues, healing miracles, exorcisms, nature miracles, etc. 1) What does the Bible say? —This question is concerned with such issues as textual criticism, parallel passages, the larger and more immediate context. It takes into consideration an exegesis of the text in the original language, which includes the lexical, historical, cultural, and significance of words and their relationships. 2) What does the Bible mean? —a matter of interpretation. Hermeneutics is based on the first question and deals with this second question (See Below). 4) The issues that challenge us today. Papyrus - a writing material made from an Egyptian plant; cheaper, but not as durable. Parchment (Vellum) - animal skins used for writing; more durable, but also more expensive. Dating: Traditionally, dates before Christ are written "BC," and dates from the time of Christ "AD" (Latin for Anno Domini, "in the year of the Lord"). These designations are specifically Christian. Jews, Muslims and members of other religions based on the Bible, may feel uncomfortable referring to the "Year of the Lord" when they do not share that belief. For that reason, modern Biblical scholars use the terms BCE (Before the Common Era), and CE (the Common Era) as a means of dating historical events. The Bible was NOT written in English -- not even "King James English"! Most of the books of the Old Testament were originally composed in Hebrew (with a few portions in Aramaic), while the entire New Testament was originally written in Greek (although some books may also incorporate Aramaic sources). Thus, what most people today read is not the original text, but other people's translations of the Bible. But why are there so many different English translations of the Bible? And why can't churches or scholars agree on just one translation? No original manuscript of any biblical book has survived! All of the texts written by the biblical authors themselves have been lost or destroyed over the centuries. All we have are copies of copies of copies, most of them copied hundreds of years after the original texts were written. The extant manuscripts contain numerous textual variations! There are literally thousands of differences in the surviving biblical manuscripts, many of them minor (spelling variations, synonyms, different word orders), but some of them major (whole sections missing or added). Important old manuscripts were found in the last 200 years! Recent discoveries of older manuscripts (esp. the Dead Sea Scrolls and the Codex Sinaiticus) have helped scholars get closer to the original text of the Bible, so that modern translations can be more accurate than medieval ones. The meanings of some biblical texts are unknown or uncertain! Some Hebrew or Greek words occur only once in the Bible, but nowhere else in ancient literature, so their exact meanings are unknown; and some biblical phrases are ambiguous, with more than one possible meaning. Ancient languages are very different from modern languages! Not only do Ancient Hebrew and Greek use completely different alphabets and vocabularies, but their grammatical rules and structures (word order, prepositions, conjugations of verbs, etc.) are very different from modern English. Every "translation" is already inevitably an "interpretation"! Anyone who knows more than one modern language realizes that "translations" often have meanings that are slightly different from the original, and that different people inevitably translate the same texts in slightly different ways. All living languages continually change and develop over time! Not only is "Modern English" very different from 16th century English, but the language used in Great Britain, America, Australia, and other countries are slightly different from each other (in spelling, grammar, idioms, word meanings, etc.). Cultural developments require new sensitivities in language! Recent awareness of the evils of racism, sexism, anti-Semitism, and other forms of discrimination have shown have certain language is slanted or biased, with corresponding efforts to develop more "inclusive" language alternatives. Thus, NO translation is "perfect" (none of them can be completely "literal" or 100% identical to the original texts) and there is NO "best" translation (all of them have some advantages and some drawbacks). In general, however, the most recent translations (1980's or 1990's) are better than the older ones (esp. the KJV or the Douay-Rheims, both about 400 years old), not only since the English language has changed significantly over the centuries, but more importantly because of the ancient biblical manuscripts that have been discovered in the last 50 to 150 years that are much older (thus closer to the originals) than the manuscripts available to the translators of previous centuries. How do you find your way around the Bible? Most Christian Bibles have adopted the order of the Greek Bible, which arranges the books of the Old Testament in four parts: The Pentateuch, the Historical books, the Prophetic books, and the Wisdom books. 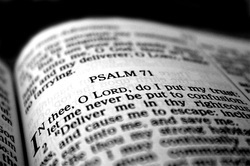 There are 66 books in Protestant Bibles and 73 in Catholic Bibles. When searching for a reference in the Bible, first locate the book, then turn to the chapter, then search for the verse(s). The names of the books of the Bible are usually abbreviated in a reference. For instance, Genesis may be abbreviated Gn., or Gen., depending on your version of the Bible. The first figure following the title of the book is the chapter: Gn.3. The second figure(s) separated by a colon, indicates the verse. For example, chapter 3, verses 14 to 16 of the Book of Genesis would be written like this: Gn.3:14-16. A hyphen is used to indicate several chapters of verses. For example, Gn.2-5 denotes Genesis, chapters 2 through 5. A semicolon separates two different references. Gn.2;5 denotes Genesis chapter 2 and 5. A comma separates different verses in the same chapter. Gn.2:4,8,11 indicates Genesis chapter 2, verses 4, 8 and 11. The lower case "f" added to a figure indicates "the following verse." Thus Gn.2:4f denotes Genesis chapter 2, verses 4 and 5. A double "ff," Gn.2:4ff, indicates an indeterminate number of subsequent verses. If you want to indicate only a part of a long verse, you add lower case letters to the numbers. Thus Gn.2a indicates Genesis chapter 2 and the first part of verse 4. Gen.2:4b indicates Genesis chapter 2 and the last part of verse 4. ca. : This is short for circa, and means about or approximately. It is usually used in regard to dates. cf. : This little abbreviation stands for confer, which means “compare” in Latin. It is used in academic works to ask a reader to continue forward and look at another reference that confirms a statement. sic: This means “intentionally so written;” in other words, the editor or author knew they were misspelling something or using a bit of slang or bad grammar in an otherwise formal document. It’s also used to indicate that it is printed as it was in the original. v.v. stands for verses (v.v. 19-25). Originally, there were no chapters or verses in the Bible as parchment or papyrus were difficult to come by. There were not even spaces between words or sentences. In the 13th Century, the Books of the Bible were divided into chapters for the first time by Stephen Langton, a professor in Paris (who later became Archbishop of Canterbury). In 1551 a Parisian book printer, Robert Stephanus (French "Estienne"), is credited with dividing those chapters into verses; therefore, we have our modern division of verses. Also, in the ancient Hebrew manuscripts, the text was written without vowels. It wasn't until the 7th Century C.E. that the vowels were fixed. In addition, the text was written and read from right to left (not left to right as in our Bibles), and there were no spaces between the words. In cases like this, Bible scholars have to trust their instincts and the context in which the passage is found to determine the meaning. Did you read "Woman, without her man, is nothing" or "Woman, without her, man is nothing?" The placing of the simple comma changes the meaning, doesn't it? In the Jewish Old Testament the text was written from right to left (also from back to front!). This might seem impossible to read, but see if you can decipher the following line by reading from right to left. Did you read King David Killed Goliath? If so, you are correct indeed! St. Isidore of Seville, bishop and doctor of the Church, was one of the most learned men of his day. He is being considered as patron saint of computer users and the Internet. He wrote: "All spiritual growth comes from reading and reflection. By reading we learn what we did not know; by reflection we retain what we have learned. Reading the holy Scriptures confers two benefits. It trains the mind to understand them; it turns our attention from the follies of the world and leads us to the love of God."